If you’re looking for something slightly off the beaten path in modern Jewish music, check out Prophets ‘n Blues. With musical stylings rooted firmly in rock, blues, & folk, and lyrics born from Torah and modern Jewish experiences, Prophets ‘n Blues hopes to entertain and engage with their music and live performances. Prophets ‘n Blues was started in the early 2000s by singer/songwriter Abe Finkelstein and his bass playing brother-in-arms Jonathan Koza. On their first album, entitled The Aural Law EP, they are joined by long-time drummer/vocalist extraordinaire, Graham Tugetman and multi-instrumentalist Eric Lipper to create a sound that is both classic and refreshing. The band hopes to continue playing and recording both their English lyric and Torah text/more traditional songs, should they be afforded future opportunities. 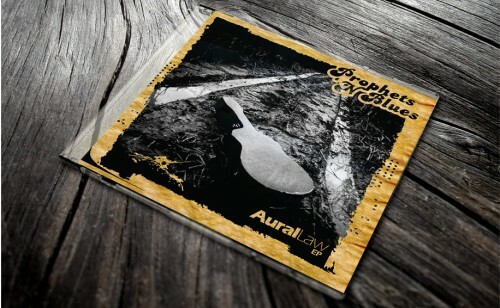 The brand new EP is available for download at http://www.nimbitmusic.com/prophetsnblues/ and hard copies can be ordered by emailing afacupuncturist@aol.com. You can get all the latest news by going to Facebook and “friending” Abraham Finkelstein or signing up at the Prophets ‘n Blues Facebook page at http://www.facebook.com/pages/Prophets-n-Blues/158681014174589?v=app_96687436973. Stay tuned for more with Prophets ‘N Blues. Meanwhile you can get a little taste by listening to the mp3 below.